Thomas Birch (1779-1851) was one of the first American artists to specialize in marine and landscape paintings. Born in England in 1779, he came to Philadelphia in 1794 with his father, artist William Birch. They worked together as William Birch & Son and engraved and published views of Philadelphia. 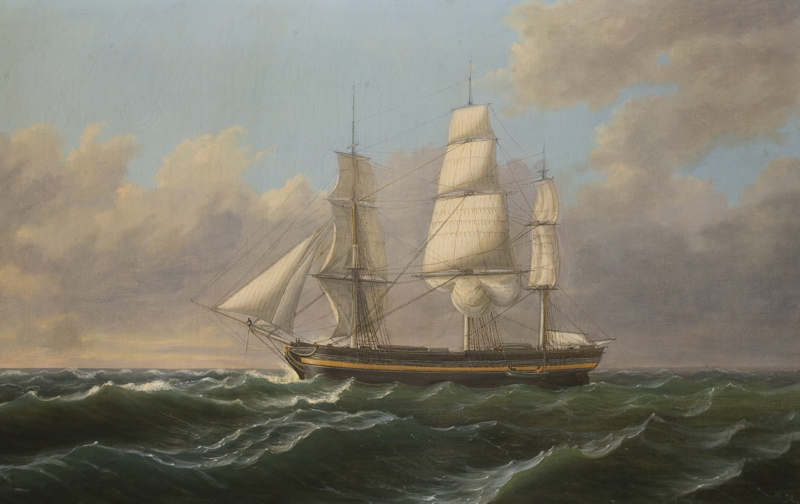 Birch’s rise as a painter began during the War of 1812 for his paintings of naval engagements of the fledgling U.S. Navy. The patriotic nature of the subject made these paintings popular. Aside from battle histories, Birch was also known for his landscape-style depictions of harbors. These landscapes are in the Dutch style, slightly romanticized yet essentially accurate portrayals. Also included in Birch’s body of work are dramatic shipwreck scenes, ship portraits, and winter scenes. Birch frequently exhibited his work at the Pennsylvania Academy of the Fine Arts and the Artists’ Fund Society, formed in 1835. His art was influential in the later development of the Hudson River School of painting and the style of romantic realism, characterized by romanticized and idealistic depictions of nature and American landscapes. Philadelphia Harbor from the South, ca. 1840. 19 1/2" x 29 5/8". Library Company of Philadelphia. Bequest of Dr. James Rush, 1869. 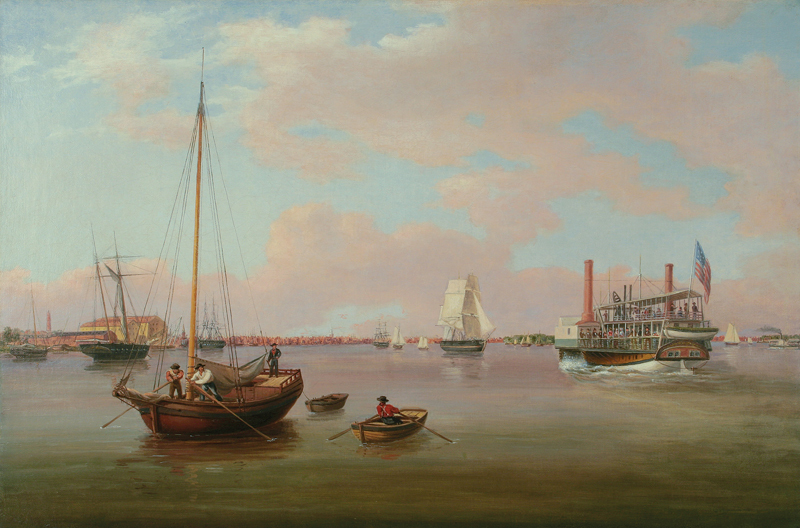 Philadelphia Harbor from the South is a quintessential demonstration of Birch’s maritime work. 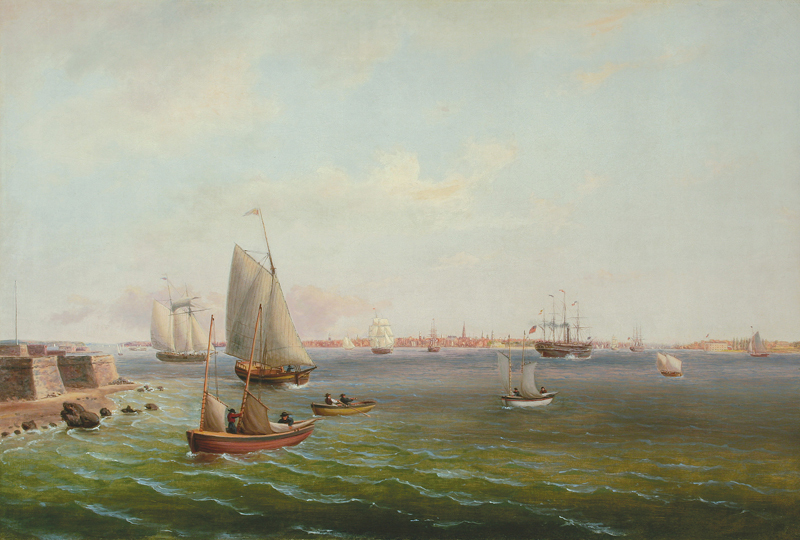 The painting is one of his many on-scene paintings of the New York and Philadelphia harbors. Within the picture, the remarkably detailed coastline shows many famous landmarks, such as Spark’s Shot Tower on the left, the steeple of Christ Church in the center, as well as the Old Navy Yard. Anchored in front of the Navy Yard is what is believed to be the U.S.S. Pennsylvania, which is thought to be the largest sailing man-of-war ever built in the United States. At the right is the steamboat Robert Morris, built in 1830. In considering this painting as an archetypal example of Birch’s work, we can see the important beginnings of romantic realism. The remarkably accurate depictions of the ships and the shoreline are contrasted with the colorful and idyllic sky. 20 3/8" x 32" . The Independence at sea is a display of the maritime portraiture for which Birch became known. Although his landscape work is considered groundbreaking in the development of American art, this painting is an example of how Birch managed to make money from commissions. In addition to occasionally painting captains and other figures involved in maritime efforts, Birch would also paint “portraits” of various ships for their owners or masters. These ships can be identified by their figureheads, flags, or name. The Independence was the first ship-of-the-line commissioned by the U.S. Navy and played an important part in the American victory in the First Barbary War. New York Harbor - View of New York from Upper Bay near Bedloes Island. This harbor scene showcases Birch’s skill of precision and detail. Birch is known for his accurate illustrations of ships as well as the landscape. The spirit of the young nation can be seen through the city’s harbor, bustling with commerce and activity.